Israelis like to boast about their success in developing the Negev, but under the Byzantine empire, Christian Arabs were the first to turn the desert into a garden. If we visited the central Negev 1,700 years ago, far from a barren wasteland peopled mainly by nomads and lizards, we would see a countryside dotted with farms and monasteries. Vast fields of grain, olive groves and fruit orchards lined the wadis; vineyards produced some of the most popular wines in the ancient world. There were also at least seven large towns supporting trade and agriculture in the area. Although their remains are listed by UNESCO as World Heritage sites, archaeologists have barely scratched the surface in some of them. 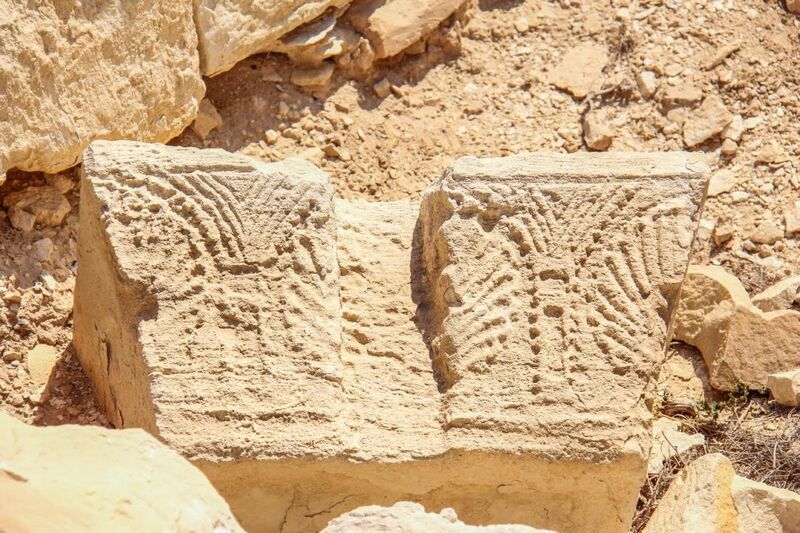 The names on the tombstones of Ruheibe’s cemetery and the morphology of dozens of skeletons that were dug up, further indicates that most of the inhabitants were Nabateans, Dahari told Haaretz during a visit to the site. 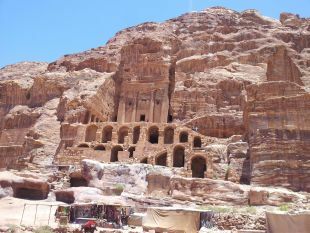 The Nabateans were a semi-nomadic Arab people best known for building the spectacular rock-cut city of Petra and a trade empire that brought spices and luxury goods from the Orient to the Mediterranean. In fact, the Byzantine towns of the Negev started out in pre-Roman times as Nabatean trading posts on the spice route between Petra and the port of Gaza. Later they also profited from the passage of Christian pilgrims between Jerusalem and St. Catherine’s Monastery in Sinai. So why would rich merchants, fat on the profits from selling frankincense and myrrh, decide to settle down and become farmers? And that’s probably what the Nabateans did. In the 3rd century C.E., the Roman empire underwent a political and economic crisis that disrupted trade routes. 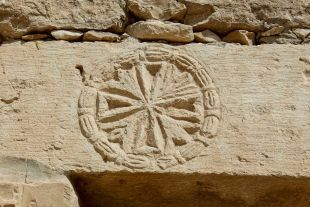 During the next two centuries, the fall of the Western empire and the spread of Christianity throughout the Mediterranean further reduced the demand for the luxury goods that the Nabateans had supplied. “They could not move north, because during the Byzantine period, the Holy Land was very densely populated. So they had to settle and farm this land, possibly with the support of the Byzantine administration and outside experts,” Dahari explains. The climate would not have been much different from today, with rainfall averaging around 100 millimeters a year, he says. So, their entire lives were centered on capturing and storing the rains that each year fall in the Negev during brief, violent showers. The entire city was plastered and paved to channel water toward the cisterns dug in the courtyard of each house. 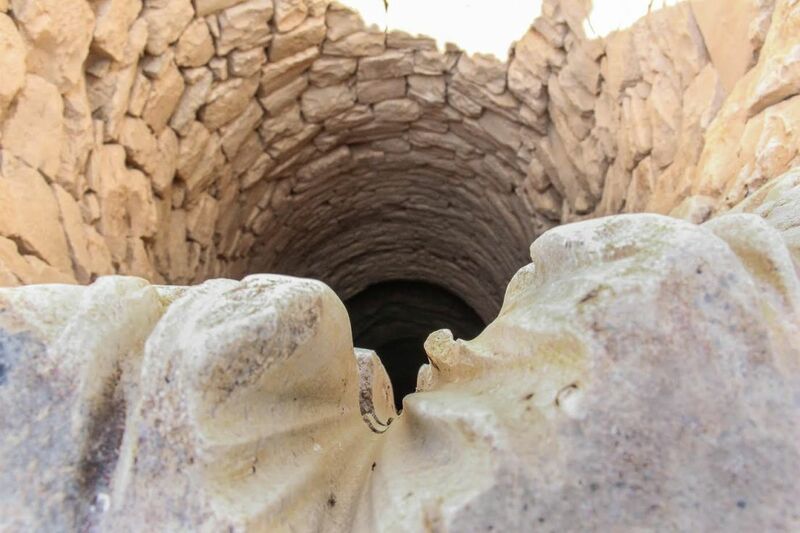 Larger cisterns and open-air reservoirs were built in the surrounding countryside, along with wells that could reach the underground aquifer – up to 63 meters deep, like a 20-story building. This system would have been just enough to provide water all-year round to satisfy the basic drinking and washing needs of the inhabitants, according to Dahari. But what about the fields? For this, just around the town of Ruheibe, the inhabitants built 250 kilometers of terraces, dams and canals, using a vast 180,000 cubic meters of stone, according to a survey conducted by Dahari and his team. This system would be used to control the violent floods that usually follow the rare storms in the Negev. Instead of running off into the desert, the water would be channeled into the terraces, where it would soak the ground, helping to keep it moist for the rest of the year. Similar systems have been found around other settlements in the area, including at Shivta, where a solitary olive grove still survives atop a stone terrace which, judging from the pottery archaeologists found there, was built in the Byzantine period. (Scientists are still working to try to date the trees). Despite the backbreaking work required, from the 4th to the 7th century C.E., the communities of the Negev did not merely survive, they thrived. 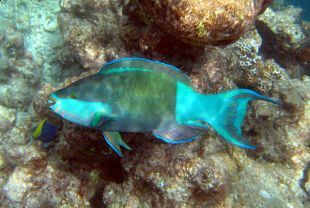 Locals could afford to import exotic goods, like parrot fish from the Red Sea, hundreds of kilometers away. Meanwhile, they shipped their produce, including fruits, olive oil and especially wine across the Mediterranean and beyond. The distinctive amphorae in which the sweet, highly alcoholic wines of the Negev were packaged have been found as far as Italy, France and Britain, says Bar-Oz. And then, almost overnight, it all ended. If you walk through the streets of Shivta and other Byzantine desert towns you notice something strange about the crumbling houses: most of the entrances were neatly sealed with large stones. It’s as if one day the inhabitants packed up their belongings, sealed their homes and left, never to return. 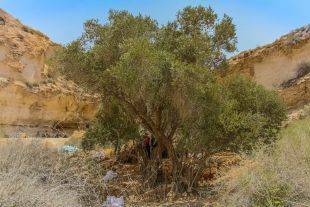 Why that happened remains a mystery, and is one of the key questions behind a project, led by Bar-Oz and funded by the European Union, to investigate the Byzantine Negev using advanced scientific methods. Many theories have been put forward. It is however too early to draw conclusions, Bar-Oz says. One preliminary study, based on dating samples from the ancient garbage dumps outside Halutza, suggest that organized refuse collection in the city abruptly ended around the year 540. This could point to a crisis connected to the Plague of Justinian, a pandemic that is estimated to have killed millions in Europe and the Middle East at that very time. But there is little or no evidence in the area of mass graves or other signs of such a catastrophe, Bar-Oz notes. Other data from the garbage dumps of Halutza indicates that as the years went on, locals used an ever-increasing amount of low-quality wood as fuel, which may suggest they were facing climate change. 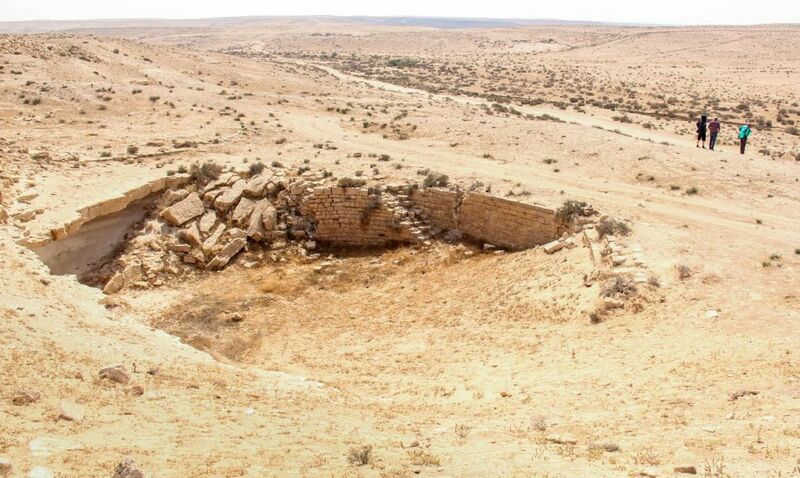 Finally, one theory that historians have long favored, connects the decline of the Nabatean settlement of the Negev to the Muslim conquest in the first half of the 7th century. However, there are few signs of violence and destruction in the Negev towns associated with the arrival of Mohammed’s followers. Many of the settlements, including Shivta, continued to be inhabited in the early Muslim period – albeit by a smaller population. Dahari, the archaeologist who dug at Ruheibe, explains it all by theorizing that the Muslim takeover of the Middle East and the collapse of Byzantine control in the region meant the inhabitants of the Negev simply became freer to leave and seek greener pastures in more fertile areas of the Levant.